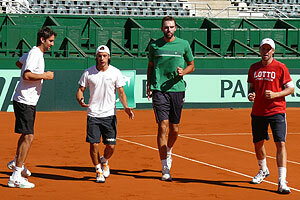 BUENOS AIRES – The entire team of Croatia Davis Cup for the first time he trained at the Parque Roca stadium, facing a series of quarter-final against Argentina, which will be played from 6 to 8 April, the Global . and Antonio Veic, who arrived on Friday, practiced on the courts and 1 center of the venue of the meeting, led by the captain, Zeljko Krajan. For its part, Argentina returned to training on the Argentine Tennis Club on Saturday and will for the first time in the Parque Roca, 9 to 13. The Croats will work this Saturday, from 14 to 18. Cilic is the best in Europe as a whole, located in 23 th place in the world ATP rankings, while Karlovic (54 º) will be the second singlista. Both figures visitors arrived in Buenos Aires from Miami, where both were eliminated from the Masters 1000 by Argentine Juan Martin del Potro, the best place in the next round of Davis Cup. Argentina, meanwhile, will begin practice on the grounds of Villa Soldati with Del Potro (11 °), David Nalbandian (50 °), doubles player Eduardo Schwank (32 º in the specialty), plus the deputy Juan Ignacio Chela (32 th in singles) . The captain, Martin Jaite, await the arrival from Miami Potro Juan Monaco (21 º), who faces Novak Djokovic (1 °) of the semi-finals taking place in Key Biscayne and will be in the country as soon finalize its participation in that event. Beat Argentina in the opening round of 2012 World Group in Germany, as a visitor for 4-1, while the Croats were imposed on Japan by 3-2, also in visitor status. The winner of the series between Argentina and Croatia will play a semifinal against the Czech Republic or Serbia-are measured in Ostrava-, between 14 and 16 September.